It's fall and that means we can all eat giant bowls of chili! 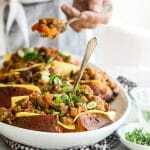 These sweet potatoes are topped with plant-based chili and cheese for the perfect dinner. Rub the sweet potatoes with olive oil and season with salt and pepper. Wrap each potato loosely in foil and bake in the oven for 90 minutes. While the potatoes are baking make the chili. In a large pan heat the 3 tbsp. of olive oil and add the diced eggplant and spices. Stir for 5 minutes until the eggplant has started to soften. Add the Gimme Lean Sausage and break it down into chunks with a wooden spoon in the pan. Add the beans, tomato and peas. Stir to combine. Simmer uncovered on low for about 40 minutes stirring every so often. Once the potatoes are done, slice them in half long ways but not all the way through and open them up. Lay a slice of cheese in the middle of each potato and then top with a big scoop of chili. Garnish with fresh chopped parsley and green onions. Serve at once.